Prelude: In preparation for another change to The Big A (which I'll discuss in another post), I stopped by K-Mart on the way home from yard sales and bought 5 cans of black spray paint and 2 cans of gray textured stone paint. I thought I give the paint a try-out before tackling The Big A.
Ms Fleur-di-Leis : Ms. Leis has spent much of her life being an after thought. 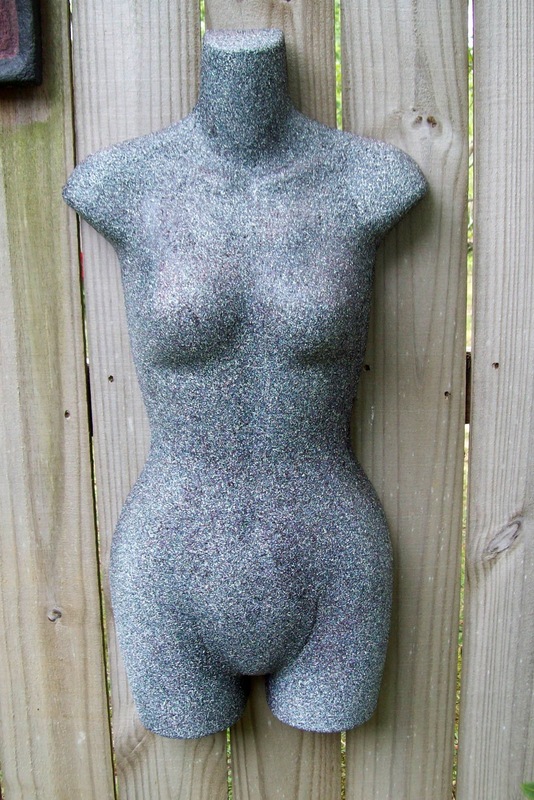 Back in those days when I was hand moulding concrete torso's, I decided to make one the full thickness. And thus, this torso was created. I didn't like her (at this thickness) much and so, she spent a couple a year or two hanging on the fence in a far corner of the yard. 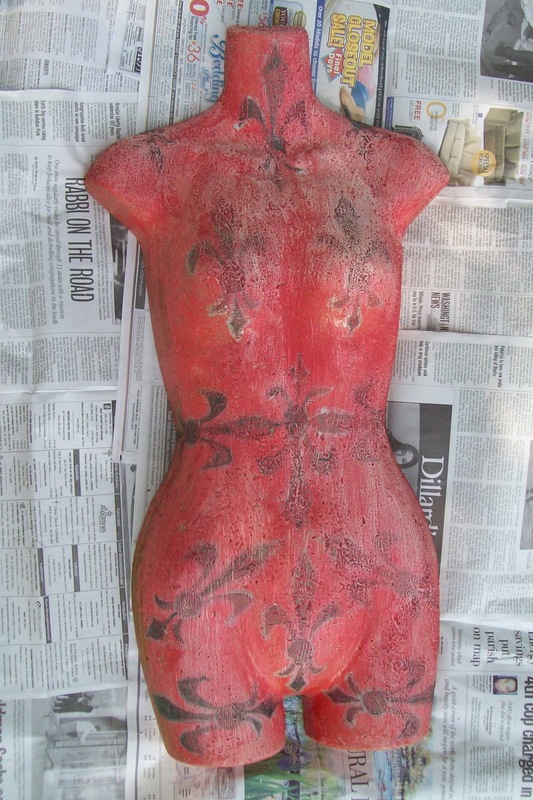 Then, upon a long overdue whim, (Spring of '95 I think), I cleaned out the area and decided that I really must do something with the concrete torso (throwing her away just didn't feel like the right option), so I took her inside and painted her red with a black Fleur-di-Leis pattern. Then, I took her back outside, to the opposite side of the yard and hung her back on the fence. And, other than a month or so stint tucked away inside the shed for Hurricane Katrina, she's been on that fence. 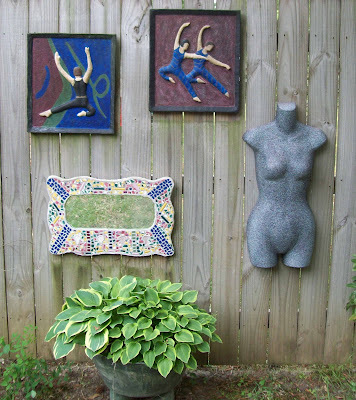 I check her out frequently as a type of study -- durability of acrylic paint on concrete in full sun (versus a couple painted pieces I have in the shade). She's pretty faded, making her a good candidate for a makeover. So, I brought her down and cleaned her with a bleach solution and let her dry in the sun for a couple hours. Then, sprayed her with a coat of black spray paint. Dry for another hour and then sprayed with a coat of the Textured Stone Spray Paint. Hummm .... boring; but, I suppose, better than she was looking. 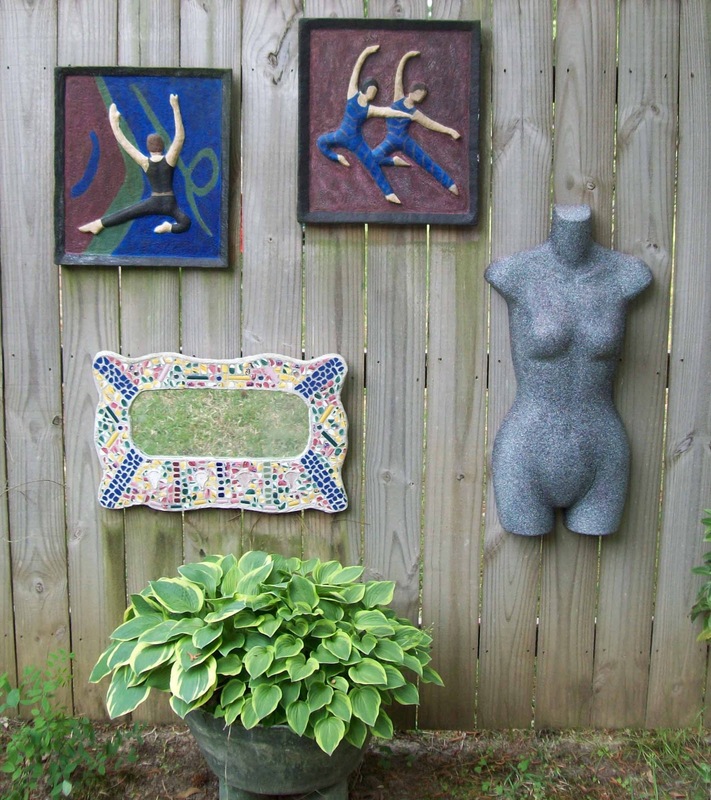 Along her her new wardrobe, I moved her over to hang with the carved concrete dancers, a mirror experiment that's still holding up quite well and one of the concrete tub planters. This area overlooks the tomato garden where she can be Beau's Muse of Bountiful Blessings.